Lake Como, one of the most beautiful spots in Italy, has been a vacation destination since Roman times. It's nestled into the foothills of the Alps, just south of Switzerland and an hour north of Milan. Without the busy monuments and museums of Italy's large cities, it's a perfect place for a relaxing getaway. Don't let yourself get caught up in trying to plan lots of things to do - there aren't many here, and that's exactly the point. The main activity around Lake Como is to simply enjoy being there. Take life at a slower pace, lingering over all your meals and always allowing yourself a few extra moments to admire the views. Four or five days should be enough for leisurely walks and elegant villas to become your new routine, but stay longer if you want it to really sink in. 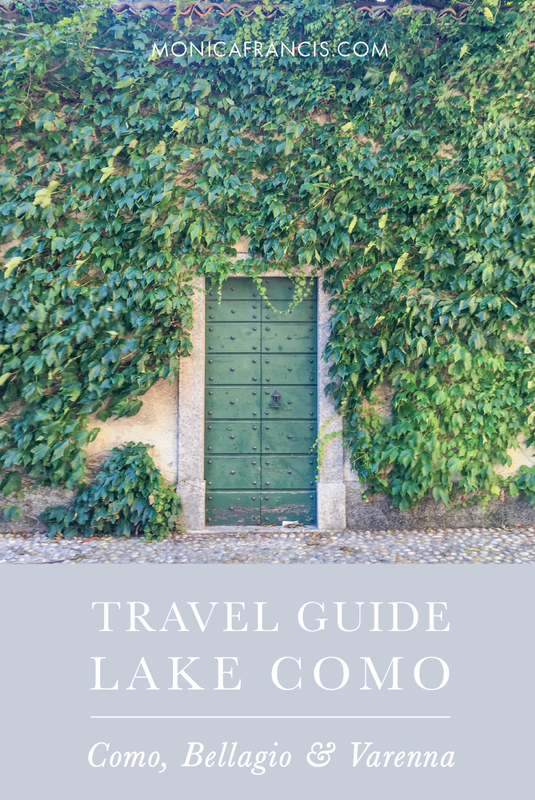 If you're traveling by train, you'll probably arrive in the charming town of Como, full of shops and restaurants. This is a beautiful place to spend an afternoon having a meal - try La Vita è Bella - and taking the quick funicular train up to your first view over the lake. But the best of Lake Como lies further north, so board the next ferry to the heart of the region, Bellagio. Take the 50-minute speed ferry, or opt for the slower 2-hour ferry for a closer look at all the tiny villages that line the lakeshore. My advice: take the slow ferry up to Bellagio, and the speed ferry on your way back at the end of your trip, or vice versa. Overlooking the three branches of Lake Como, Bellagio is possibly the most picturesque town in the lake district. It's also the most central spot, making it an ideal place to stay. Check into an apartment at Residence La Limonera, a room at Hotel du Lac or Hotel Florence, or splurge on a stay at Villa Serbelloni. For your first evening in Bellagio, stroll through the center of town and keep walking all the way to the northern end of the peninsula. Surrounded by the mountains, the water, and the colorful lakeside towns, take in the panoramic view and have dinner at Ristorante La Punta, or spread out under the trees with a picnic. One morning, wake up early and walk along the waterfront promenade. It's lined with benches and flowering trees, and it's especially peaceful early in the day. Stop in at a café for breakfast and watch the main street come to life. Later, take a lake cruise to see the villas along the shore on your way to a delicious lunch. We saw Villa Carlotta and the famous Villa del Balbianello before our lakeside lunch at Locanda la Tirlindana. Back in Bellagio, tour Villa Melzi or take a guided walk through Villa Serbelloni park. The park is owned by the Rockefeller Foundation, and is home to their inspiring Bellagio Center - and the best views in town. Have dinner under the wisteria at the Hotel Florence, or over the water at La Terrazza Metropole. Anytime you want, walk through the narrow stone streets and let yourself get lost. When you're ready to see somewhere new, hop on the ferry to explore the nearby towns Menaggio, Tremezzo, Lenno, and Varenna. Varenna, tucked into the eastern side of Lake Como, is equal parts colorful port town and medieval stone village. On your way into the city from the marina, you'll pass the charming Caffè Varenna Bistrot, a perfect place to stop for an aperitivo or a light meal. In Varenna, there are countless pretty streets to follow up and down the hillside, with views of the lake and mountains all around. Take your time to explore, get a bit lost, and marvel at the sycamore trees that grow in the piazzas. Make your way over to Villa Monastero and give yourself plenty of time to see the grounds and botanical gardens that stretch along the lakeshore. From the villa, follow the steep trail up to Castello di Vezio - the spectacular views over Lake Como are well worth the hike. Have dinner on the terrace at Ristorante Hotel du Lac, and watch the sun set over the mountains to the west. 'star' the map below to access it from the google maps app on your phone.